Pittsburg High School’s newspaper featuring the article about the principal. 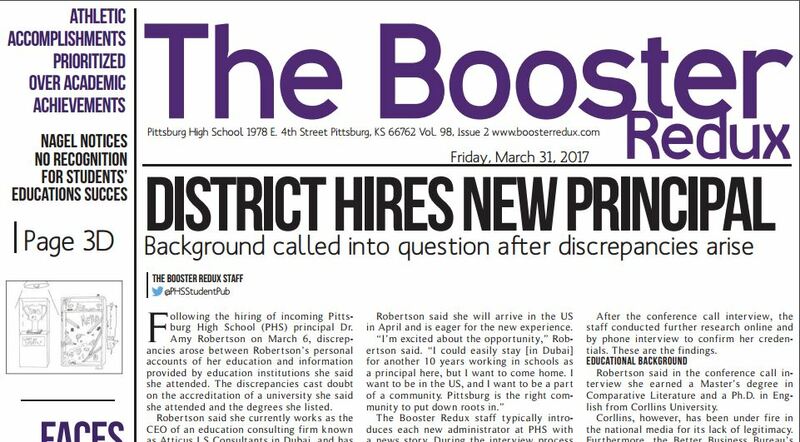 Students who worked on the school newspaper, The Booster Redux, planned to write an article about the new principal. But when the student reporters began to ask Robertson questions for the article, they found that some of her answers didn’t match up with information they found from other sources. The students talked to Emily Smith, the teacher who works on the newspaper with them, and Destry Brown, a school superintendent, about it. Smith and Brown encouraged the students to ask the new principal more questions. On March 16, the students held a conference call with Robertson, Brown and Smith. (A conference call is a phone call where several people in different locations can talk to each other at the same time.) The students asked Robertson more questions about her where she went to university, and where she had worked before. They said the answers she gave seemed incomplete and inconsistent (in other words, she couldn’t provide enough solid information about her university and experience). The students did research on the Internet and made phone calls to universities and government offices to find out the truth. They discovered that many of the things Robertson had said were not true. For example, Robertson said she graduated from a school called Corllins University. The students found out that Corllins is not a real university. It is a company that sells fake university degrees on the Internet. The students published what they had learned in a front-page story in the school newspaper on March 31. They asked for proof that Robertson had the university degrees she claimed to have. Four days later, Robertson said she would not become the school’s principal after all. 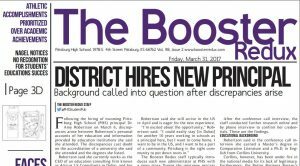 Superintendent Brown said the school board would have found out the truth about Robertson eventually, but the students’ investigation sped things up. He praised the students for not believing things just because an adult told them. Journalists around the world congratulated the students on their investigation. Is “the simple quest for truth” really all that simple? Why is uncovering the truth so important and what are the obstacles that tend to get in the way? After the high school journalists informed their teacher and superintendent about Robertson’s curious answers, do you think the educators should have taken over the investigation? Why do you think they let the students continue to investigate? When writers include an event to illustrate their point, they often begin that sentence: “For example.” This is a great technique and should be a tool that all good writers know how to use. But remember, always include a comma after these two words since it separates the introduction of the sentence from the body. Write your own “For example,” sentence following each prompt. If there’s one thing I’ve learned in life, it’s to never give up. There are many great causes to support. Some of the best video games are also the simplest in many ways.